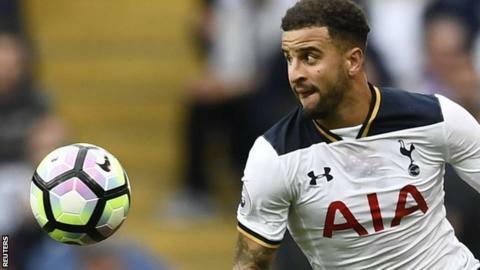 Tottenham Hotspur defender Kyle Walker has signed a contract to stay with the club until 2021. The 26-year-old right-back has played 194 games, and scored four times, for Spurs since joining from Sheffield United in 2009. "It's like my second home now, I'm very happy to commit my future to Tottenham Hotspur," he said. Walker has 20 England caps, with his most recent appearance being in the 1-0 win over Slovakia on 4 September. Sheffield-born Walker's previous contract with Tottenham, signed in 2013, was set to expire in 2019. He follows fellow England internationals Eric Dier,Dele Alli and Danny Rose, who have signed deals to commit their futures to the club since the start of September.